If you want to become a fully trained feng shui consultant, look no further. ECOFS Professional Training Course in London starts in 01 - 06 Nov. 2018. Please click on the ECOFS logo below for full course content information. An Introduction to the Core Principles of Feng Shui. 25 -26 September 2018, 10am to 5 pm. This comprehensive and intensive Feng Shui Society Approved foundation course is designed for participants with little or no prior knowledge of Feng Shui. It aims to provide students with a sound introduction to develop their understanding and appreciation of the vast subject of traditional Feng Shui. The teaching methods are a mix of theories and practical applications. We will go into the core principles to find the answers to encourage you to think deeper about your living environment and how it can affect your own outcomes. By the end of the two days you will be able to make some basic changes in your home and in your life. An attendance award is given upon completion of the course. Students’ learning will be supported with generous detailed course notes. Howard Choy is bi-lingual and China-trained in traditional Feng Shui, in practice for over thirty-five years. He will give you a genuine understanding of the traditional theories and contemporary practice of Feng Shui, using materials drawn from recognized Chinese Feng Shui classics. Then you will start to understand what Feng Shui really is about, why it can be so powerful and how to begin to use it yourself. Graduate students who wish to pursue the subject further will have gained the foundation knowledge required to join our ECOFS two year practitioner level training, which is fully accredited by the Feng Shui Society. 229 Great Portland Street, London, W1W 5PN United Kingdom. During these two day I will be on hand to meet prospective students who may be interest in doing the FSS accredited Professional Practioners Training Course, so do drop by and I can expalin in detail what you can achieve with this two-years course. "Hitching a Ride with your Yearly Star"
To book: Please contact Sylvia Bennett in London: 020 7419 7828 / 07779 139187. 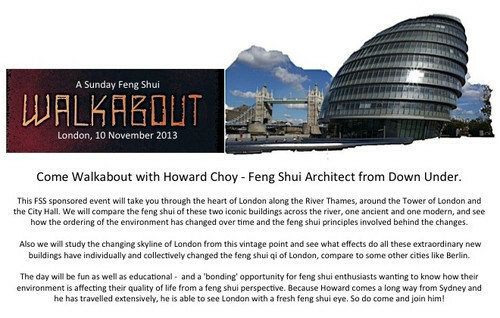 Howard Choy: fengshuiarchitect@hotmail.com (ECOFS Berlin). Did you know there are two different ways to work with the yearly stars in a Flying Star chart? One is the well known method first written up by Master Shen Zhu-Nai in his Flying Star classic, “Shen Shi Xuan Kong Xue” (“Shen’s Xuan Kong Study”) published in the early 1900s and the other is the less known “secretly passed down” method from the Jiang Zhong-Shan lineage. 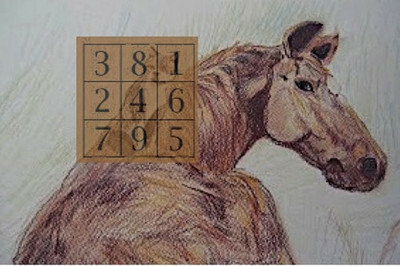 This one-day special workshop will show you how these two methods differ from each other and how you can use them effectively with an individual house chart, in particular for the current year of the Horse (2014). The course will include a case study concentrating on practitioner skills development. You are also welcome to bring in your own work sample or your own house plan for us to use as job samples, so you can hitch a ride with your lucky stars for the Year of the Horse. All welcome, although a certain amount of Flying Star knowledge is an advantage but not necessary. Knowing what is Qi and how to analyse it is a core competence required of a Feng Shui consultant, yet many are uncertain about how it can be done in a clear and systematic way. In the consultant’s training day we will take you through this process step-by-step, both in theory and in practice, using sample case studies. Teaching notes and a working checklist will be made available for each participant. How to practically integrate all audited information into a meaningful whole to analyse the qi of a place. Come along and refresh your understanding and use of Qi! Howard Choy was born in China then brought up to Australia. He is China trained in classical feng shui, having studied with many eminent teachers including Master Ren Zhi-Lin from Hong Kong and Professor Wang Yu-De from Wuhan. He is well versed in the theory and application of kanyu feng shui from both an academic and practitioner’s perspective. As such, he takes pride in his cultural heritage and has always been motivated to ensure that feng shui, a living tradition from his birthplace, can continue to thrive and enjoy success worldwide. A practising architect, Howard has moved from Sydney to Berlin, where he runs an architectural practice with his wife Gyda Anders. He is also principal of the European College of Feng Shui (ECOFS), teaching feng shui and consulting throughout Europe. K B Lim, Derek Walters, Howard Choy, Neil Kingham, William Spear. Workshops: Howard Choy, William Spear. In October 2012 Howard Choy took a group of students on a Feng Shui study tour of China. They visited over twenty historical sites, including ancient towns, traditional villages, temples, a UNESCO listed grotto and a 1500 years old wooden pagoda that has survived numerous earthquakes. A great deal was learnt about how feng shui was applied in traditional buildings. Several of these ancient sites and modern projects will be presented to demonstrate how feng shui has sustained the test of time and works just as well in the present as it did in the past. Having learnt the basics of Flying Stars, many have trouble dealing with a changing period or a changing yearly star in their charts. In just 3 hours this workshop will show you how to look at the influence of the current Period 8 on a building built in an earlier period and also how to carry out the two different ways of assessing the influence of a yearly star, one written by Master Shen Zhu-Reng (Shen Shui Xuan Kong Xue) and another passed down by Master Luo Shi-Peng from the authentic Jiang Zhong-Shen lineage. Please feel free to bring in your own work samples for us to look at and we can use them as practical case studies after learning the theories ( we can only accept one or two examples, so please register early). This is a rare opportunity for you to learn something not being widely taught elsewhere. Some basic knowledge of Flying Star is required to reap the benefits of this short course.